The Airport Guys have posted another preview picture from Myrtle Beach International Airport (KMYR) for FSX. Big Fat Simulations Airport Madness 4 for PC and Mac is now available to purchase at SimMarket. Oovee Game Studios has released the Cessna C337 Skymaster Sound Pack for FSX. Available to purchase at SimMarket. Virtual Dispatch has been updated to version 0.6.1. More information at the Virtual Dispatch Website. QualityWings has posted this sound demonstration from the upcoming BAe146/Avro RJ for FSX and FS2004. Oryx Simulation Software has posted the first preview pictures from the upcoming Eindhoven Airport (EHEH) for FSX. McPhat Studios has posted previews from the PMDG Boeing 747 World Airliners 3 - Malaysia HD Textures (HDT). McPhat Studios has posted previews from the PMDG Boeing 747 World Airliners 3 - Delta HD Textures (HDT). Flylogic has posted preview screenshots and information from the upcoming Lugano Airport (LSZA) for FSX. Orbx has updated their scenery libraries to version 120204. Now available to download at the Orbx Support Website. 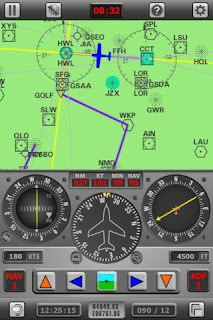 Digital Aviation has updated the Radio Navigation Simulator (RNS) for iPad, iPhone and iPod. Available at the App Store. Jörg Dannenberg has updated the freeware FlightPort Mannheim-X (EDFM) and Marburg-X (EDFN) sceneries for FSX. The freeware Helicidade Heliport (SIBH) for FSX is now available to download at Terra Brasilis. Black Box Simulation has re-released the PSS Boeing 757 Professional for FS2004. Details at the Product Page. 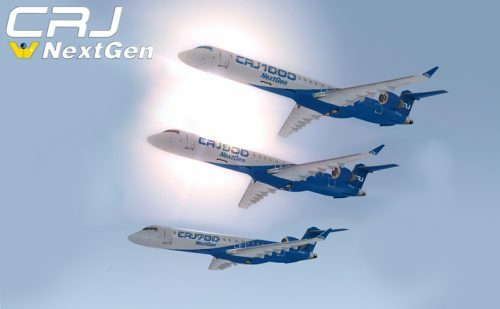 The Wilco Publishing/feelThere Bombardier CRJ NextGen for FSX has been announced at SimWare. AirTrack for the iPhone, iPad and iPod Touch has been updated to version 3.1. Details at the AirTrack Website. - New in version 3.0 is the concept Turbine Twister, a Rolls-Royce RR300 Turboprop powered Twister for insane aerobatic fun! Orbx has released the freeware Claresholm Industrial Airport (CEJ4) for the FTX Northern Rocky Mountains region. Flightbeam has posted an update on the development of Phoenix Sky Harbor International Airport (KPHX) for FSX. A_A Sceneries has added new previews from the upcoming Phuket International Airport (VTSP) scenery for FSX. - Lots of animations like oil cooler doors, Ram door, canopy, windscreen wiper etc. - Highly realistic flight mechanics (several test flights were done in the real aircraft to verify the simulated model). The freeware El Hierro Island photo scenery for X-Plane 9 & X-Plane 10 is now available to download at X-Plane.org. Blue Sky Scenery has released the freeware Carrizo Plain Nat'l Mon., Soda Lake photo scenery for FSX and FS2004. 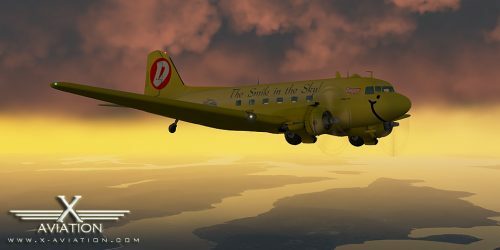 Leading Edge Simulations has posted the first official in-sim previews from the upcoming Douglas DC-3 for X-Plane 10. FlyTampa and Other Airports Coming to X-Plane 10? VertigoStudios has posted another preview screenshot from the upcoming Boeing Stearman 'Kaydet' PT-17 for FSX. Vertical Reality Simulations (VRS) has announced commencement of TacPack for FSX closed beta testing. FS Magazin - Issue 2 2012 (german language only) is now available to purchase at SimMarket. Miami International Airport (KMIA) for X-Plane 9 & X-Plane 10 is now also available to purchase at SimMarket. McPhat Studios has posted previews from the PMDG Boeing 747 World Airliners 3 - El Al HD Textures (HDT). McPhat Studios has posted previews from the PMDG Boeing 747 World Airliners 3 - Air China HD Textures (HDT). LHSimulations has released version 2.0 of of the freeware Pécs-Pogány Airport (LHPP) for FSX and FS2004. 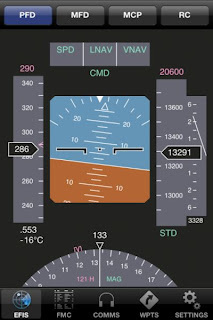 The freeware weather add-on FSrealWX for FSX and FS2004 has been updated to development version 1.03.1316. The freeware Christchurch Airport (NZCH) photo scenery V1.0 for X-Plane is now available to download at X-Plane.org. ArezOne-Aviation Soundstudios has released the Piper P46T Malibu JetPROP Pratt&Whitney PT6A-21 SoundSet for FSX. QualityWings has posted several livery previews and flight deck screenshots from the upcoming Boeing 787 for FSX. The makers of TOPCAT have posted another status update on the upcoming PFPX - Professional Flight Planner X.
Khamsin Studio has posted this teaser screenshot from the North American T-28C Trojan V2.0 for X-Plane 10. The free Global Aviation Magazine Issue 5 is now available to view and download at the GAM Website. 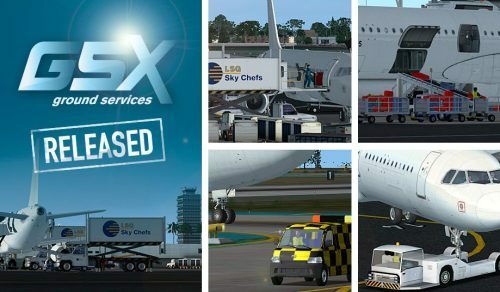 FSDreamTeam (FSDT) has released the long-awaited Ground Services X for FSX. Details at the Product Page. - Supports all default FSX airplanes and many popular 3rd party airplanes. - NEW Live Update feature, keep GSX always updated automatically, with new supported airplanes and airports! FlightSim Developers February Sale on select titles for FSX and FS2004. Valid through February 29th 2012.